THIS PRODUCT HAS BEEN DISCONTINUED AND IS NO LONGER AVAILABLE. Please check out Ray Dynamic Color as an alternative tool to manage colors in After Effects. Assists you to browse through color themes obtained from Adobe Kuler. Dynamically link any color property within your comp to a color of the color theme. Please check out Ray Dynamic Color as an alternative tool to manage colors in After Effects. Assists you to browse through color themes obtained from Adobe Kuler. 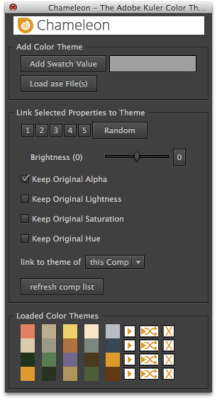 Dynamically link any color property within your comp to a color of the color theme. If you select another color theme, all linked colors in your comp update automatically to the new color theme. Develop your motion graphics based on some Adobe kuler color theme and once you are finished see how it looks with a different one. Simply load a new color theme and your entire composition updates automatically. Do color correction based on Adobe kuler color themes by pushing highlights, midtones and shadows towards different colors of your color theme. Your projects still work on machines where the script is not installed. You can watch a tutorial explaining Chameleon on Aetuts+. Chameleon allows you to conveniently work with color themes from Adobe kulerin 3 steps. Dynamically link any color property within your comp to a color theme color. Once you load a new color theme, all linked color properties in your comp update accordingly.